Sometimes searching for true love can be a little…Outlandish. At 29, Emma Sheridan’s life is a disaster and she’s tired of waiting for the perfect boyfriend to step from the pages of her favorite book. There’s only one place to look, and it means selling everything and leaving her world behind. With an unexpected collection of allies along the way, can Emma face down a naked fishmonger, a randy gnome, a perfidious thief, and even her own abdominal muscles on the journey to find her Fraser? 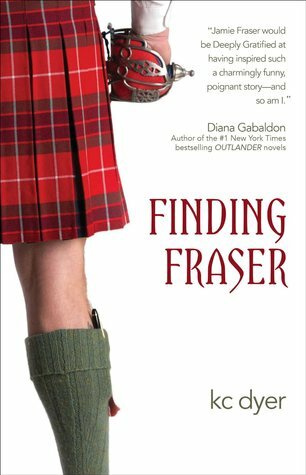 This was a fun read, even for someone who has never read any of the Outlander series. (Gasp! I know – they are on my TBR pile!) I think nearly everyone knows the basic concept behind the novels, so it wasn’t hard to figure out what Emma was referring to when she did talk about Diana Gabaldon’s books. The book alternates between chapters telling us the story, and blog posts that Emma writes as she goes along. The blog posts are short and sweet, and sometimes provide a little insight into things that have not yet been fully disclosed in the story. I did feel that the heroine was a bit naive for 29. I often wanted to yell into the book at her, and to point out how blind she was being, or how ridiculous some of her choices were. Even so, Emma is a likable character, and I couldn’t help but root for her and wish her success in her quest to find love. I have to add that I love books about other books, and books that even just mention other books. Books mentioned within other books have given me some great reading recommendations, and because of them, I’ve read things I would never have picked up otherwise. The Outlander series has definitely jumped higher up my ever-growing list after reading this story! NOTE: I received a free copy in exchange for an honest review. All thoughts and opinions are my own. Haven’t read the Outlander either but this one sounds good. I love the Outlander books, but I could not get through this one. The writing was just…not engaging, I guess. Glad you liked it, though! I saw this book on the shelf at my bookstore the other day and thought it sounded like a fun, light read. I think I’m going to have to check it out. It’s perfect if you’re looking for a light read – hope you’ll enjoy it!